1. Add all ingredients to a small saucepan. Place over a low heat and cook, covered until apple is soft. 2. Add all ingredients to a small saucepan. Place over a low heat and cook, covered until apple is soft. 1. In a medium-sized bowl whisk together almond meal, brown rice flour, buckwheat flour, quick oats, cinnamon, gluten free baking powder, and salt. 2. In a separate bowl whisk together yoghurt, milk, eggs, vanilla and brown sugar until well combined. Gently stir in apple. 3. Make a well in the centre of the dry ingredients and add apple mixture. Whisk until just incorporated. 4. Heat a non-stick heavy bottomed frying pan over medium heat and add a little olive oil or butter to grease the bottom of the pan. 5. Add approximately 1/4 cup of batter to the pan. You may have to spread the mixture out a little in a circular shape. Cook until bubbles appear on the surface of the batter (about two minutes). Once most of the bubbles have popped, flip pancake over and cook for another two minutes on the other side. 6. Transfer pancake to a plate and keep covered while you repeat with the remaining batter. You may be able to cook more than one pancake at a time depending on the size of your frying pan. 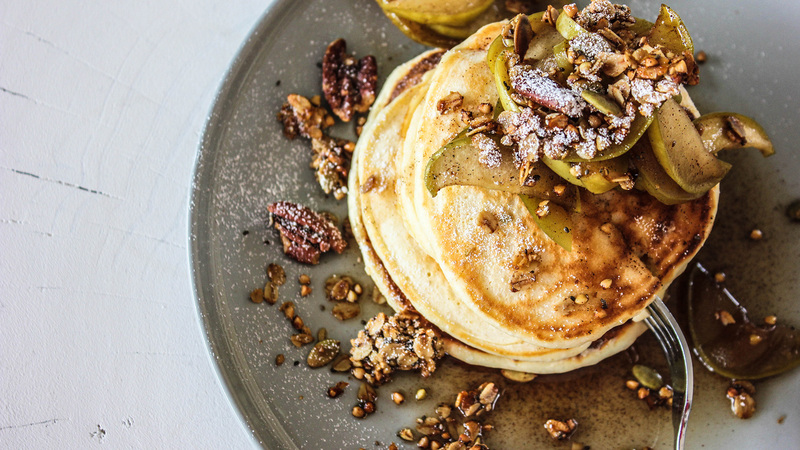 To serve, top pancakes with stewed apples and other toppings if desired.